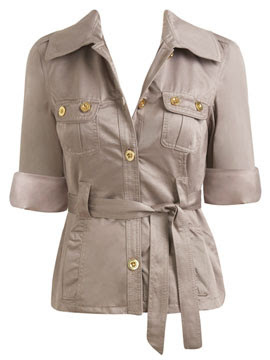 Sateen hip length safari coat features metallic button down front and shirt collar. Double flapover button breast pockets feature pleated detail. Front slash pockets, belt loops, self tie sash, and back slit. Cuffed sleeve features tabover button detail. Sleeve unrolls to full length and double button detail. Lined. 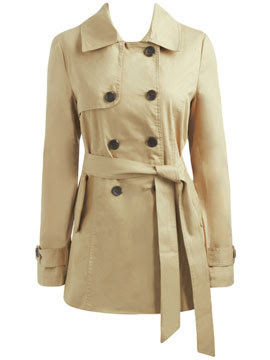 Trench coat features double breasted button front, large shirt collar, and front flapover slash pockets. Long sleeves features tabover button detail. Self tie belt. Lined.